This week Caitlin, Rachel, and Emmy read Fellowship of the Ring, Book 2 Chapter 7, the Mirror of Galadriel. The group reach the elvish city of Caras Galadhon and stay there for some time. Here’s a map of Lothlorian and the surrounding areas. The Creature of the PitPats – ???? Nimrodel and Amroth – Elves who lived in Lothlórien many years ago. We hear a song about them. The Fellowship make it to from Drimrill Dale to the woods of Lothlorian in this chapter. 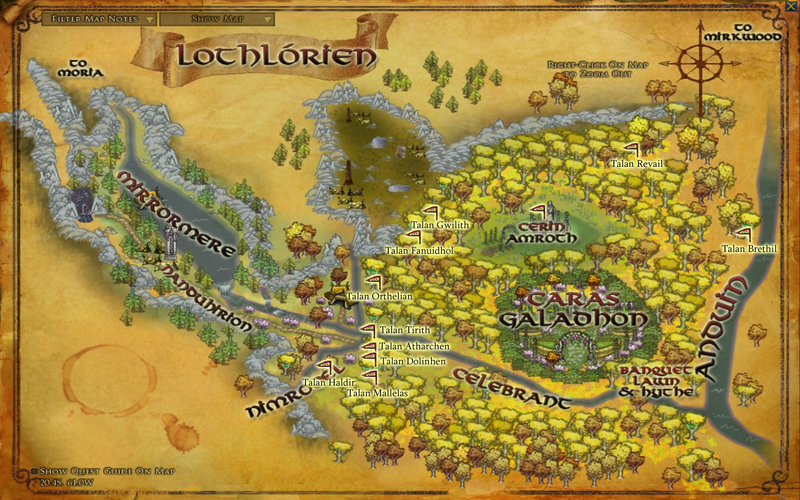 In the same map as last week, you can see the woods of Lothlorian and where Cerith Amroth (the old centre) is in comparison with Caras Galadhon, the new centre of the city. This week Caitlin, Rachel, and Emmy discuss Fellowship of the Ring, Book 2 Chapter 4, Journey in the Dark. Gimli – Wants to go to Moria because Dwarf home! The Fellowship in full heads into Moria to make their way directly through the Misty Mountains, instead of taking a pass through the range. . Follow the red line on this map. This week we talk about Fellowship of the Ring Book 2, Chapter 3 The Ring Goes South. AND we do it in less than two months. Merry – Yeah, they’d rather not go, but if Frodo has to, they they do too. Aw, friendship! Gandalf – The actual intelligent person who’s going along. Aragorn – Representative of men, bearer of the reforged sword Anduril, going with. The Fellowship in full heads south from Rivendell, along the Misty Mountains, and tries to pass over them, but is turned back by the angry Caradhras. This week we discuss Fellowship of the Ring, Book 2 Chapter 2, The Council of Elrond. Legolas – son of Thranduil. Glorfindel – an elf who once leant Frodo his horse. Erestor – an elf from Rivendell, advisor to Elrond. Thranduil – the elf king in Mirkwood. I only mention him here because I believe this is the first time we hear his name. Balin, Ori, Oin – dwarves from the Hobbit. No travel in this chapter! The party is at Rivendell.